Comment: Existing concrete patio and walkway in backyard is in pretty good shape with some minor repairs needed. Was painted in 2013 but has faded. Have newer concrete walkway in the front of the house also. Would like to have all of it painted and/or other lasting finish technique to match. Comment: expand pool patio area matching the existing patio blocks. Probably a 20x20 area of additional space. Comment: I have a patio that has some cracks in it that I would like repaired. It's about 500 square feet and appears to have been repaired in the past. Comment: Repair cracks and refinish and redcoat. Comment: The back patio is already smooth concrete but is very slippery when wet. Would like to cover existing concrete area with stamped concrete. Area is about 900 square feet. Scottsdale Concrete Contractors are rated 4.84 out of 5 based on 1,028 reviews of 49 pros. 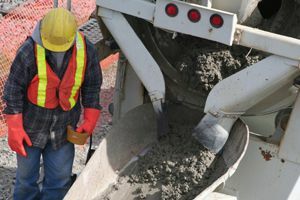 Not Looking for Concrete Contractors in Scottsdale, AZ?